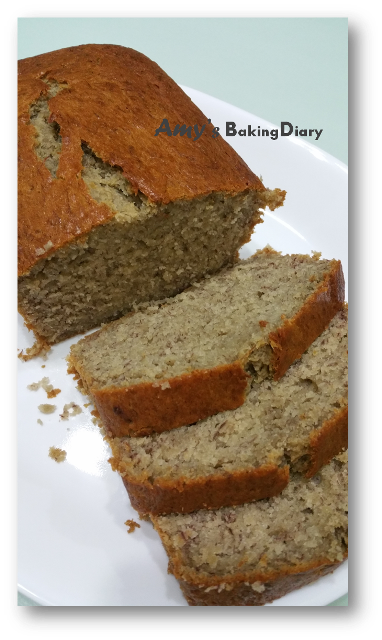 Amy Baking Diary: "The Most Fabulous Banana Cake"
"The Most Fabulous Banana Cake"
Today is a very tearful moment that Singaporean is sending off our founding father Mr Lee Kuan Yew. It was a very emotional moment for everyone in Singapore. I was so deeply moved as I see thousands and thousands lined the streets of Singapore to say goodbye to Mr Lee Kuan Yew. I was so touch by the eulogies that was on LIVE Broadcast and actually sobbing non-stop in front of the television. Mr Lee, who had done so much for Singapore, had gone away peacefully but his values, his love for all Singaporean and his words, will stay with us, inspire us and live in us for a long, long time. I didn’t have mood to bake today. This cake was bake on last weekend. 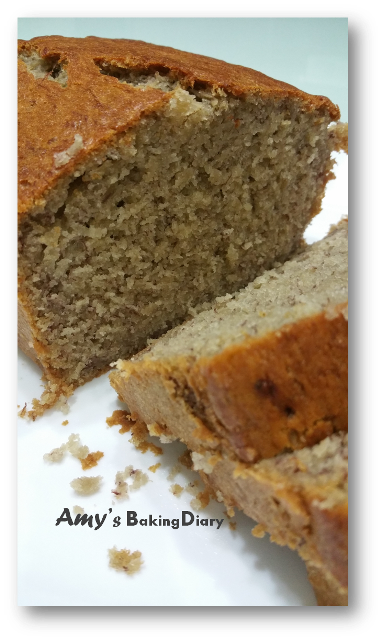 “The Most Fabulous Banana Cake”, the name of the cake attracted me when I discovered it from Joyce (Kitchen Flavour)’s blog. I decided to give it a try since she said the only way to find out how good is the cake is to bake one. I’m very curious about this cake because I have never tried baking banana cake with buttermilk. Look at the texture of the cake. 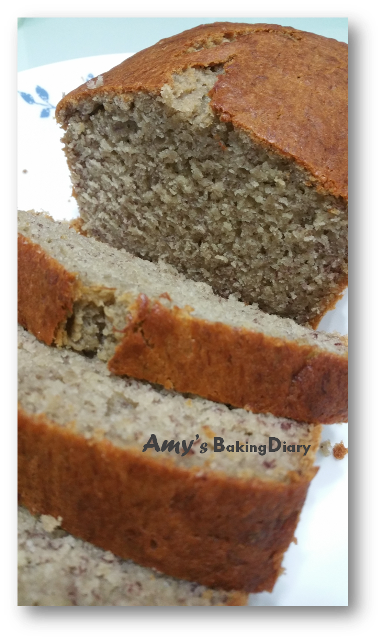 This is exactly the type of texture which my boys and hubby like it – moist, aromatic and dense. My verdict for this cake is – absolutely the most fabulous banana cake. *There’s cream cheese icing to go with cake. 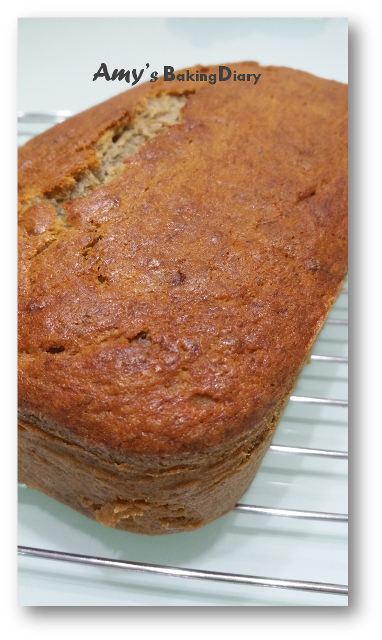 I skipped the icing because my family prefer to eat banana cake in plain as is it. (2)Put the flour, baking powder, salt and bicarbonate of soda into a food processor* and whiz them together for 15 seconds, the top them into a bowl. (3)Mash the bananas. Scrape it into the processor* and puree it until it’s smooth. Add the sugar and eggs and whiz together for 1 minute. Add the butter and whiz it for another minute or until the mixture is thick and creamy. Now add the buttermilk and vanilla extract and pulse the processor in quick on/off bursts to just mix them in. Add the reserved flour mixture and again mix it in with quick bursts, scraping down the sides once or twice with a rubber spatula, until it’s only just combined (don’t overdo it or the cake will be tough). 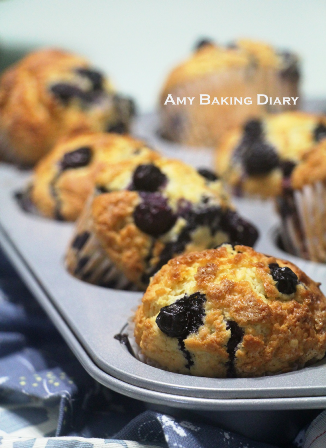 Scoop the batter into the prepared tin and smooth it out evenly. (4)Bake for 30-35 minutes (for me I baked for 45 minutes) or until a fine skewer inserted in the middle of the cake comes out clean; it won’t have risen much as it’s quite dense. Don’t open the oven any earlier than this or the cake can sink in the middle. Cool the cake in the tine on wire rack for 7 minutes. Gently loosen the cake around the edges with a butter knife or fine palette knife, then invert it onto the rack and leave it to cool completely. *I’m using my KitchenAid mixer to whiz the batter and not the food processor. 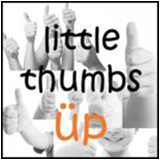 This is my 2nd post submitting to Little Thumbs Up which is organised by Zoe from Bake for Happy Kids and Doreen from My Little Favourite DIY. Me too ... sob sob in front TV watching the final farewell to the late Mr Lee. This banana cake of yours looked very fabulous. .. so nicely baked. Heard about the news of Mr Lee'e departure. It is sad to see an amazing person like him departing from our life. Hope that everyone in Singapore has recovered from the grief now. Very nice banana cake. It is indeed very fabulous! 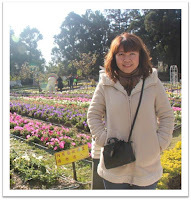 It's really a wonder, a small island with no natural resources can be so strong economically. All thanks to Mr LKY. I'm sure the good work Mr LKY left behind will be carried on by his successors. BTW, Love the tight fine crumb! May Mr LKY rest in peace! His legacy will live on. Even though I am not a Singaporean, I feel kinda sad, and it is really amazing how the nation comes together under the rain to bid him farewell. Nice to know that your family have enjoyed the banana cake! Oh wow. I am going to be thinking of this cake today. It looks amazing! Love the nice fine crumbs.